Family bath/shower and en-suite shower/w.c. Robert Luff & Co are delighted to offer this superb extended semi-detached house with the heart of sought after Angmering village with shops, schools, restaurants and pubs having good access to A27 & A24 also being just over 2 miles away from a mainline railway station serving London, Brighton, Portsmouth and Southampton. The property has spacious accommodation comprising of four bedrooms, en-suite shower/w.c and large family bathroom with double shower cubicle. There is a living/dining room, conservatory, fitted kitchen, utility area, ground floor cloakroom, ample off road parking and garage accessed via an electric gate, landscaped two tier garden, gas heating and double glazing. Internal viewing is essential to appreciate this house. Canopy entrance with steps up to obscured double glazed front door. Close coupled low-level w.c, wash hand basin, radiator, part tiled walls, smooth ceiling with coving and extractor fan. Brick and double glazed construction with pitched roof and opening window, double glazed double doors onto and overlooking rear garden, tall radiator, power and TV point. Tiled flooring, personal door to garage, double glazed window and double doors onto garden, power and light. Access to loft space, smooth ceiling with spotlights, smoke detector with cover. Corner double shower cubicle with wall mounted shower, pedestal wash hand basin, low-level w.c, part tiled walls, obscured double glazed window, smooth ceiling with coving and spotlights, chrome heated towel rail. Double glazed window with views over roof topes to the south downs, smooth and coved ceiling, radiator. Double glazed window, smooth and coved ceiling, radiator. Double glazed window, smooth and coved ceiling, views over roof tops to the south downs, radiator. Large bath with mixer tap and shower attachment over, walk in double shower cubicle with wall mounted shower, two heated towel rails, obscured double glazed and opening velux window, part tiled walls, low-level w.c, wash hand basin with cupboard below and drawers, smooth and coved ceiling with spotlights. Mainly laid to brick block driveway giving parking for numerous vehicles and approached via electric gate and brick retaining wall. Double opening doors to garage, double glazed window, power and light, wall mounted gas fired central heating boiler, radiator. 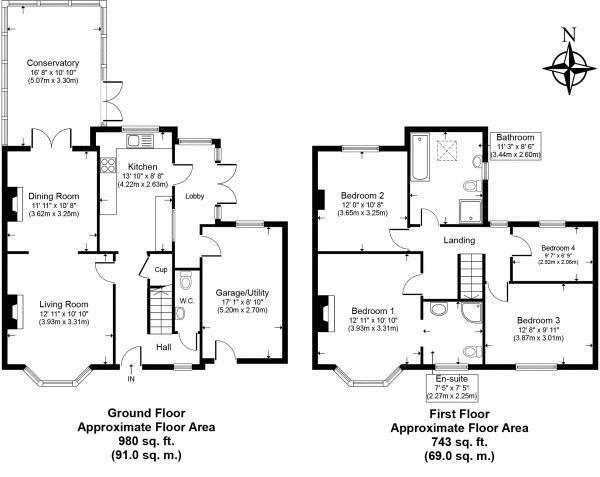 Split into two sections, laid to lawn, brick paved pathways to side giving access where there is a patio area and summer house/shed, power and light and storage above, brick and flint wall with wooden steps to side leading down to lower part of the garden with flowers and shrubs enclosed by panel fencing.